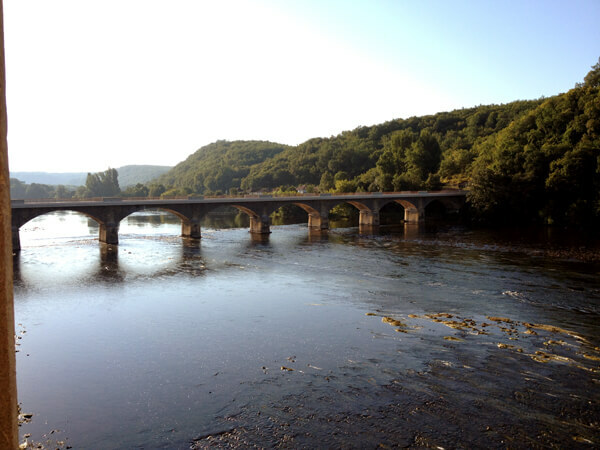 Crossing the arched bridge that spans the Dordogne River where dozens of swans nimbly trace the ripples of the water, I first spotted the Château Lalinde about five years ago. The sun cast a gold dusty hue on the exterior wall and the shutters were as red as Snow White’s ruby apple. Well-tended flower boxes spilled over the railings, and the windows and doors were opened wide to invite in the heated summer air. I knew instantly that a fairytale was alive and well, and likely sipping champagne on the terrace. 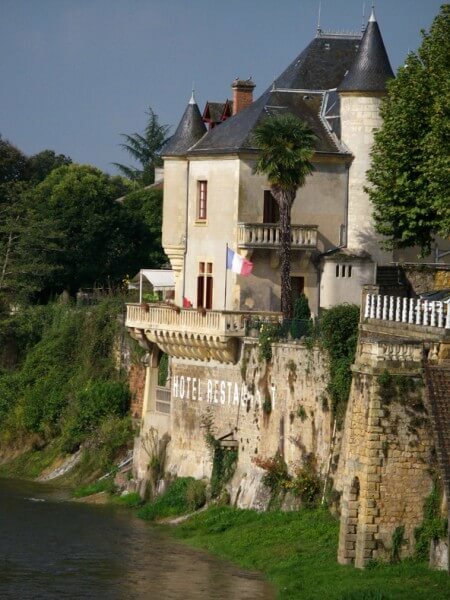 Lucky for me, this chateau was also a 5-rooom B&B in the bastide town of Lalinde, and I have since visited several times, including this past summer. But this French B&B is more than just a place to sleep. Chateau Lalinde is the private home of Wilna Wilkinson, a modern day princesse, intrepid traveler, and friend whose personal touch and life experiences are felt in every room. “Sometimes I have to pinch myself,” she admits to me, happy fate dropped her in this corner of France nearly a decade ago. When I’m here, I want to pinch myself too. Wilna’s lilting South African accent ushers a welcome as warm as a Dordogne summer. And inside her castle, the walls and shelves are filled with paintings from her childhood home, books she has both written and collected, and masks, rugs, and other tokens gathered while traveling the globe. But there is no question this chateau is home, and she makes you feel as if it’s yours while you stay. The chateau is located in the center of Lalinde, a popular market town filled with great cafés and restaurants. Wander around with her on market day (Thursday) and you’ll be stopped every few minutes by local friends eager to say hello and kiss-kiss. Wilna happily recommends restaurants in the village and surrounding areas, and will also organize outings to festivals and events. 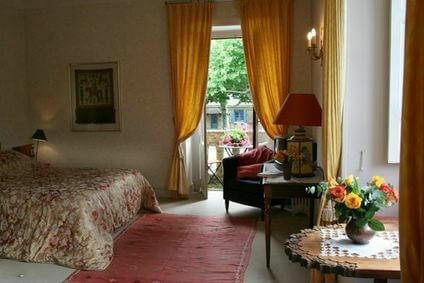 The five bedrooms of the chateau are comfortable and iformal, with floral quilts and fresh cut flowers. The bathrooms come equipped with a hairdryer, fluffy towels and robes. Most have a hand held shower head over a bath a la francais style. If you prefer a room with a stand up shower, make that known (but the views might not be as good). I really like the various common areas Wilna has set up to encourage guests to gather. On the first (French) floor landing, there is a lounge with a TV and games. The ground floor living room with views to the river is great for reading, and sipping an aperitif by the pool is a relaxing way to beat the late afternoon heat. The only room “off limits” is the kitchen, which is where Wilna prepares a sumptuous breakfast for guests each morning. Coffee, fresh fruit, juice, granola, croissant and pain au chocolate are the norm, which is served on a beautifully set table, either on the terrace or in the dining room. I asked her about the gorgeous place mats one morning and she told me she’d had them for nearly 40 years. Before I left, Wilna asked me to sign the guestbook, and in typical Wilna fashion this too was, literally, a personal touch. 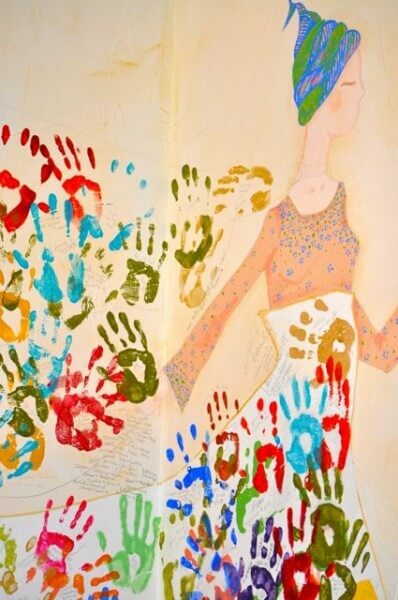 I dipped my hand in paint and left an imprint on the kitchen wall, overlapping and touching dozens of other guests’ hands who’d done the same, and signed my name. There are plenty of B&Bs in the world, and I’ve slept in my fair share, but it’s these personal details that make a stay at Chateau Lalinde feel so grand. And it’s people like Wilna who remind me just how nice it is to feel really welcomed. Rates: From €100 per person. Weekly rates available. Rates are lower for groups. Good to know: Parking is in town, not far away; 2-night minimum; the chateau is closed from November to April; there is wifi access but it works best in the common areas. 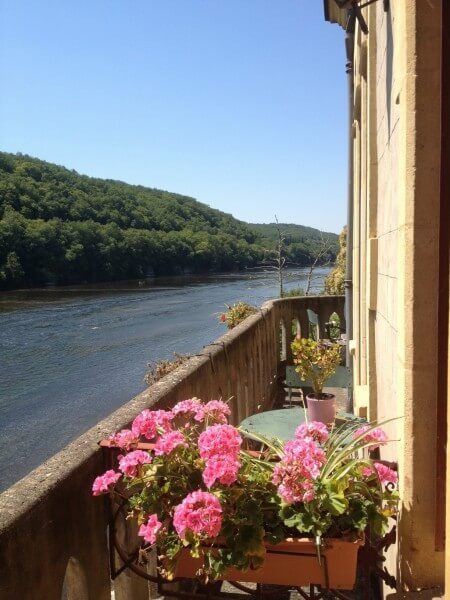 Kimberley Lovato is a freelance writer whose heart was left in the Dordogne years ago. Read more about the region in her book, Walnut Wine & Truffle Groves.